The hallway between the Learning Commons and the Special Collections Silent Reading Room in NC State’s D.H. Hill Library is used to exhibit various artifacts from the NC State Library’s special collections. Among other things in the new display is what is believed to be the world’s first fully electric guitar. At the NC State Engineering Fair in 1940, first prize went to NCSU physics professor Sidney Wilson for his invention of the world’s first fully electric guitar. The instrument was also the first to have single-string pick-up. Clearly the sensation of the fair, the guitar was played by physicist Mickey May. The Gibson Corporation had introduced a converted acoustic guitar – the ES-150 – in 1937 that used a single bar to pick up the signal from all strings. The instrument achieved some popularity, but was plagued by unequal loudness across the six strings. Professor Wilson reasoned that: 1) individual pick-ups could remedy the unequal loudness problem, and 2) the acoustical body was not necessary for a fully electric instrument. He developed the guitar shown in the figure and entered it in the annual engineering fair. 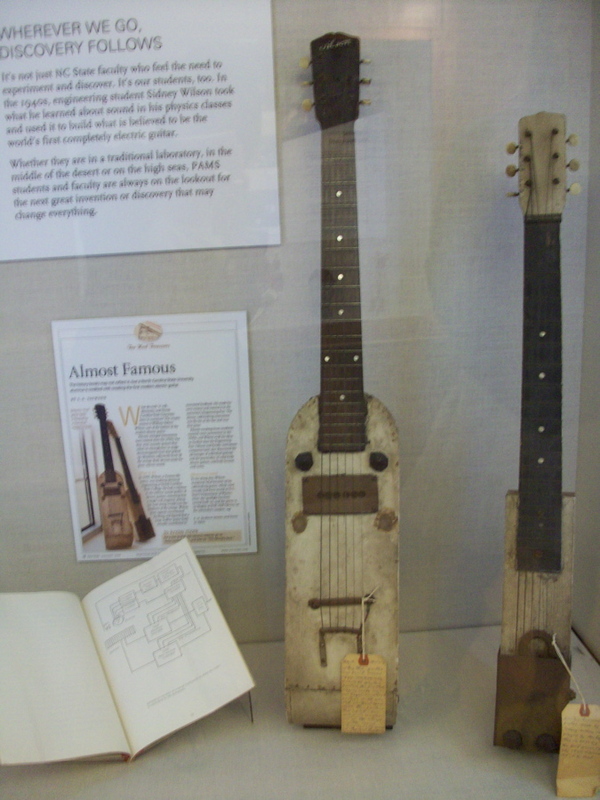 The highlight of the fair was the playing of the guitar by Mickey May, and the invention won the fair’s first prize. Patents from academia were quite unusual in the 1940s, so it is not unexpected that Professor Wilson did not patent his invention. Had he done so, it would have been one of the first patents granted to NC State faculty. In 1949 Gibson incorporated both the individual string pick-up and the cut-away body in its model ES-175. The design was attributed to Ted McCarthy of Gibson Corporation, but the features were first conceived and implemented by NC State physicists. The display guitar is part of the 50 Years of PAMS: A Legacy of Discovery exhibit, which includes a cast of a T-Rex femur and a variety of vintage physics equipment as well. According to the Special Collections librarian I spoke with, the display exhibit will be available for another month or so. Thanks for featuring our exhibit Danielle! We hope everyone will come by to see the electric guitars and all of the other interesting equipment lent to us by the College of Physical and Mathematical Sciences faculty as well as historical photos from our collection. The exhibit is available when the Library is open (24 hrs Sunday – Friday and until 10 pm Friday and Saturday night). The exhibit will be up through finals (December 16th, 2010). That is SO neat. Love everything they’ve done with D.H. Hill, by the way. Kinda makes me wish I was still a student so that I could hang there like old times! Go Pack!